With Mother’s Day approaching I have been thinking about all the mothers & daughters I have met recently to advise on chemo headwear. I have a lot of ladies come to me as they have young children, daughters in particular, who don’t ever want to see their Mummy without hair. It was this need several years ago that led me to design the Kitty sleep hat so that getting up in the night to a young child meant that Sarah’s head was covered at all times. It later transpired that she was extremely cold at night and headwear at bedtime became a necessity anyway! Then I met Caroline & she chose to wear my Alice Liberty print tana lawn headscarves at all times, night & day, & chose them in particular as her daughter loved the pretty prints. I found fabric to match one of her daughter’s head bands and made a scarf to match and I also then went on to make Liberty print scrunchies in every print of headscarf Caroline had so that her daughter could match her every day. When people come to visit me to try on various styles & colours of headwear they usually come with a girlfriend or a daughter (or two with very differing opinions as was the case last week!). It is always reassuring to have the opinion of someone you completely trust. I receive a lot of online orders from daughters who want to treat their mothers to something a little bit special that will cheer them up & make them feel pretty & feminine again. I also get a lot of orders from nieces & cousins. Mainly women understanding & wanting to treat female relatives and friends. 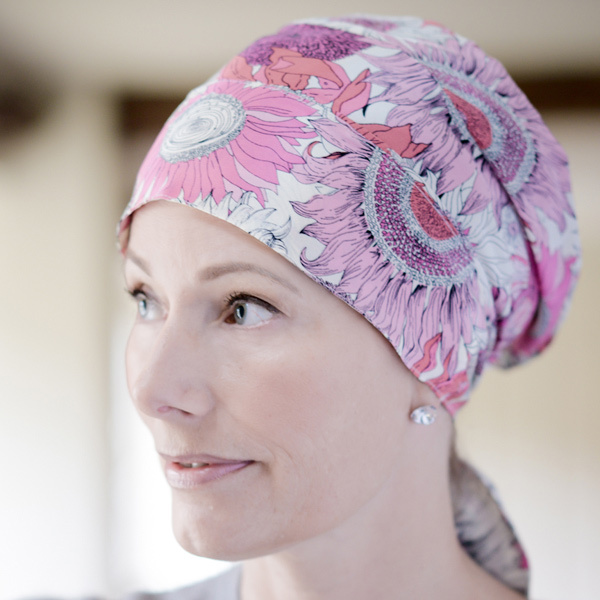 It was the lack of high quality, special, beautiful headwear rather than something you had to wear out of necessity that drove me to start chemo headwear. Sometimes you just want to treat yourself or even better be treated – maybe you should treat your mother to the cashmere headscarf made from the softest pashminas she felt was just a bit too expensive!